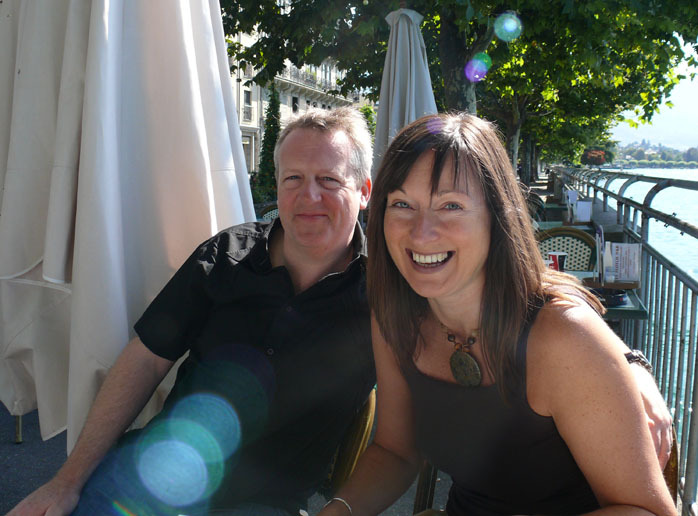 I recently had opportunity to chat with the affable Kevin and Lynn Scott of Living Voice and Definitive Audio UK*. They were in Switzerland on business and graciously took time out for an informal meet on Lac Leman. On my upfront agenda was learning more about their ambitious new Vox Olympian flagship speaker. As it turns out, the Olympians' appearance in the fall of 2009 was preceded by endless prototypes over 6 years—20 prototypes alone for the trumpet—two former commercial hornspeaker models called Air Partner and Air Scout and a very hi-tech component rack named G8. The latter evolved from a custom commission for a luxury yacht where expensive Kondo valve amps were expected to stay put during stiff seas yet absorb no vibrations from the hull to which the rack would be bolted. Certain engineering solutions and material choices of the cost-no-object G8 project flowed naturally into the finalized Vox Olympian. Ditto another rather utopian one-up speaker commission crafted from LG2 bronze in the shape of a rocket ship. 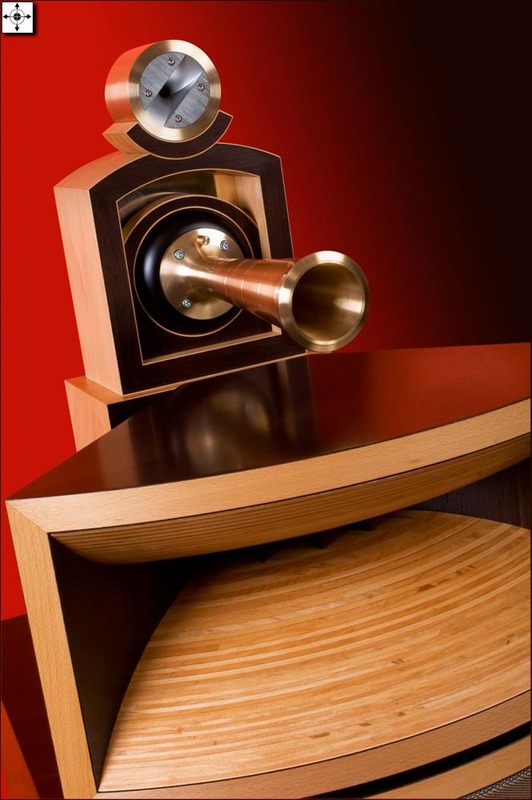 The sonic advantages of LG2 bronze are revisited in the Vox Olympian's tweeter horn. 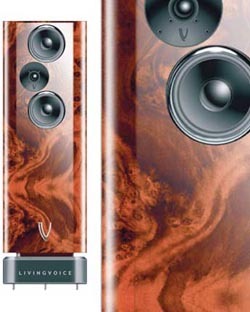 * Living Voice is the Scotts' loudspeaker brand around the popular Avatar floorstanders in their various iterations. Definitive Audio UK meanwhile is their audio importation branch under which they distribute Kondo valve electronics from Japan and other brands. To fully appreciate the bloodline and evolution of the Vox Olympian, I had to revisit Living Voice's beginnings. 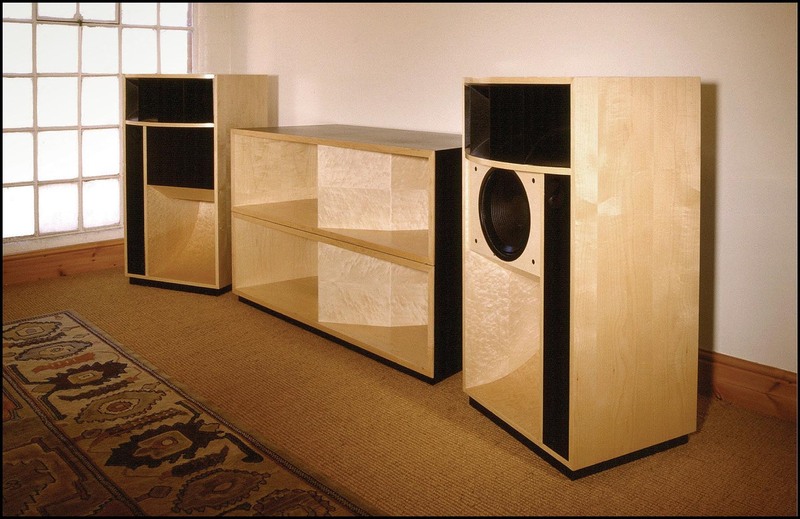 Kevin tells the tale: "In 1990 Living Voice approached Secomak-Vitavox with a proposal for a cooperative venture to develop a high- end domestic hornspeaker system. 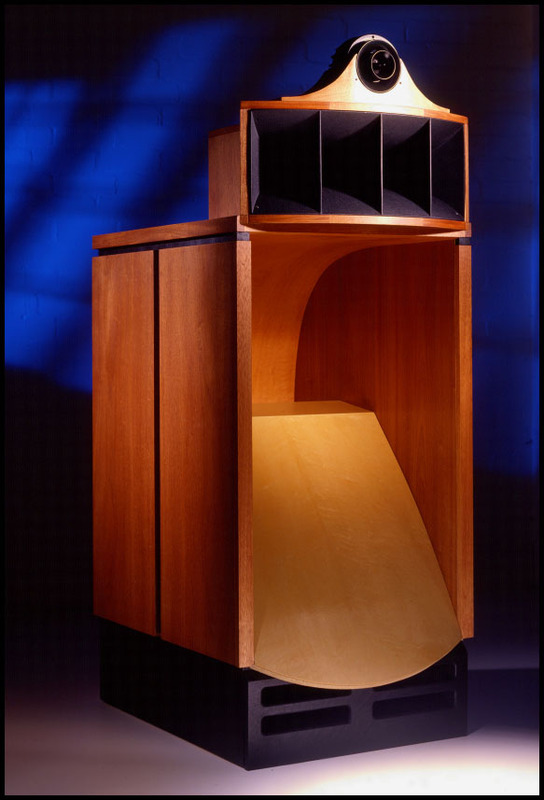 Established in the 1930s, Vitavox has an enviable heritage in the field of precision loudspeaker design. Their expertise extends to high-performance domestic audio, live music sound reinforcement, public address, commercial cinema as well as to critical military and naval applications. 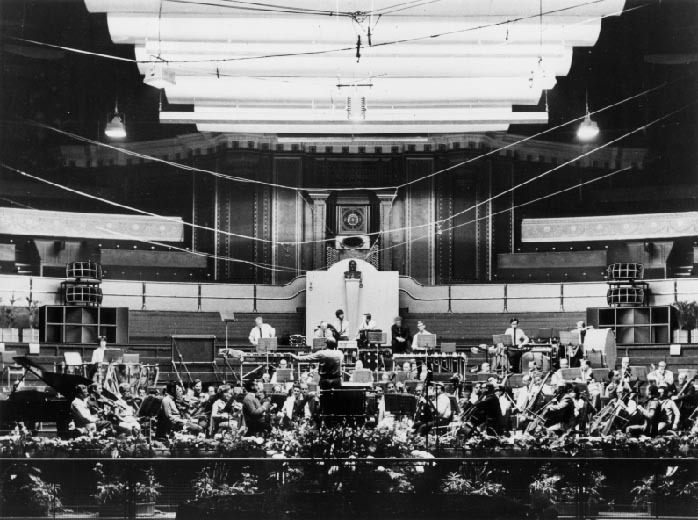 Vitavox sound reinforcement installations have included the most prestigious public venues - the Royal Albert Hall and Festival Hall to name but two. "It seemed to me that Vitavox would be the best possible partner for such a collaboration. 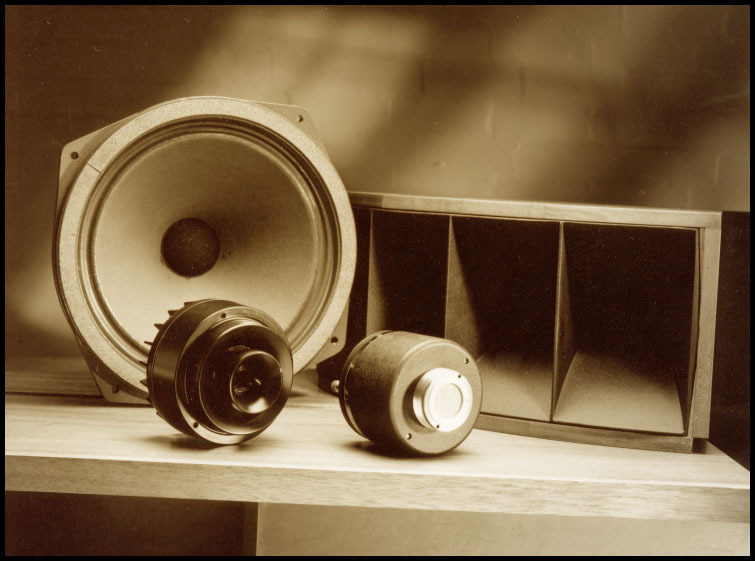 My desire was to produce a very high-sensitivity loudspeaker system (over 100dB) that could take full advantage of the inherent superiority of simple class A valve electronics. Manufacturers of such electronics at the time were in a minority. In 1990 there were less than five specialist valve amplifier manufacturers in the UK. The triode and single-ended revival had yet to gain leverage. 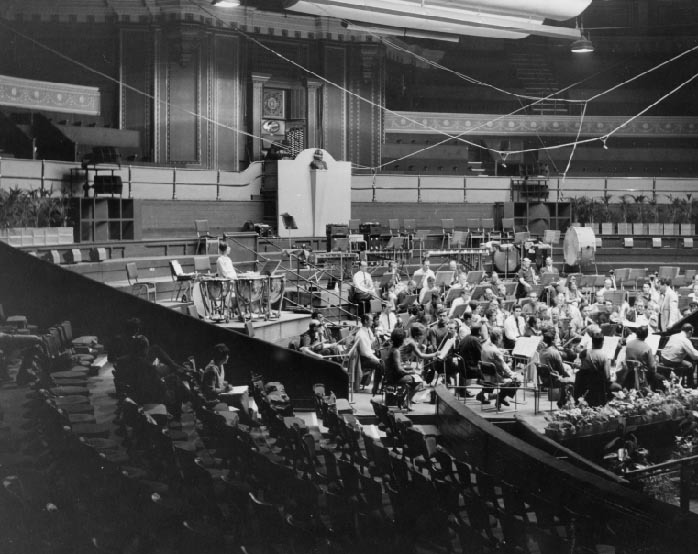 It seemed to me that in order to realize the full potential of such electronics, a loudspeaker needed to be designed specifically for the task. "During the 1970s and 80s, the bulk of Vitavox's energy and resources were channeled into the lucrative defense market - ship-to-shore loudspeakers, flight-deck loudspeakers, blast-proof loudspeakers, underwater loudspeakers, microphones, intercoms and ship 'whistles'. Domestic audio became a smaller part of a bigger picture. The two sons of the company founder David Young (technical director) and Neil Young (head of sales and marketing) had a keen familial interest in audio and a desire to see the Vitavox name return to center stage in high-end domestic audio. They were therefore pleased to proceed with a joint venture to be funded by us but utilizing Vitavox's expertise and technical resources. The name Living Voice was chosen as a fitting and respectful tribute, Living Voice being the translation from Latin of Vita Vox. "David Young was responsible for many of Vitavox's most celebrated technical innovations including the RH330 midrange horn, the S5 pressure driver and the AK157 bass driver. All of these components were chosen in the development of what was to become the Living Voice Air Partner. 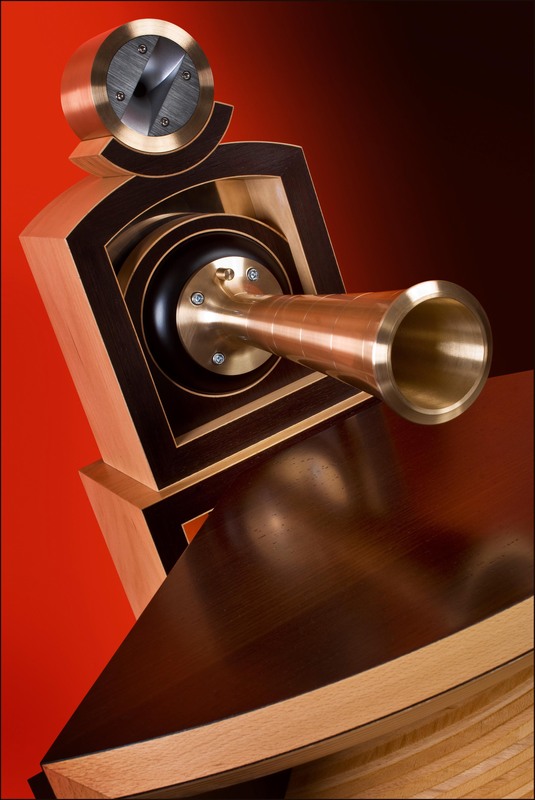 The bass horn geometry was a sophisticated evolution of the Vitavox Thunderbolt geometry, itself the product of extensive research and development. A further 9 months of meticulous empirical work resulted in a finished 3-way fully horn-loaded design. Living Voice subsequently bought the tooling rights to the Vitavox RH330 midrange horn and we were appointed by Vitavox as UK distributor for their domestic audio products. The Air Partner was introduced at the 1992 Heathrow Show. "Two years after embarking on this project, the Air Partner received its first showing at the bustling 1992 Heathrow HiFi Show in London where it caused a storm. 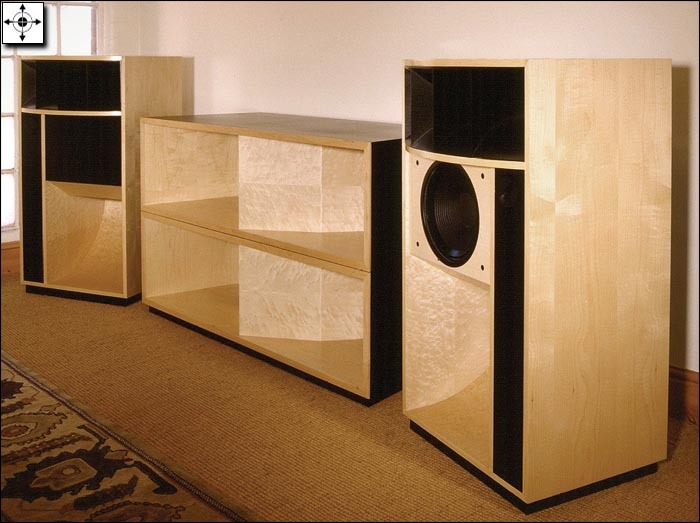 One of the magazines (Audiophile) described it as "throwing down a gauntlet to the industry". 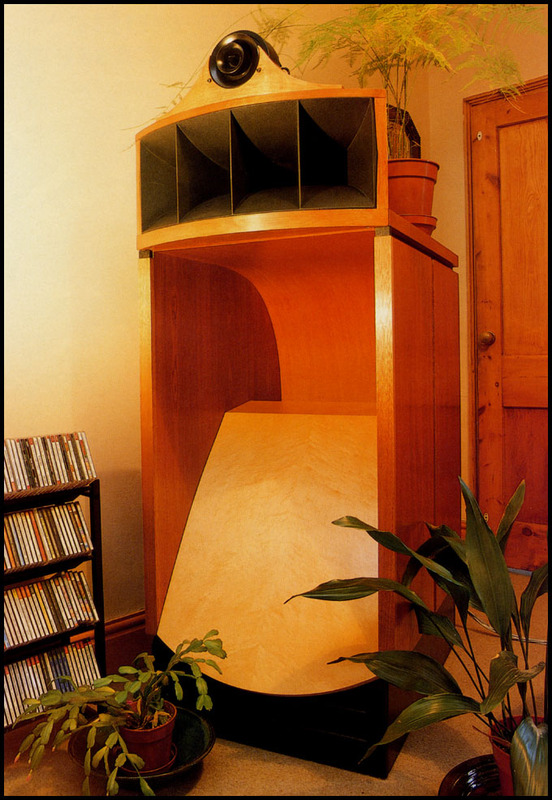 At 6' in height, 3 feet in depth and with 105 dB/w sensitivity, the Air Partner was a culture shock and in terms of quality a clear illustration of what was possible in audio when commercial and domestic acceptability considerations are cast to one side. It was about doing something in absolute terms but also from a holistic system-based perspective. 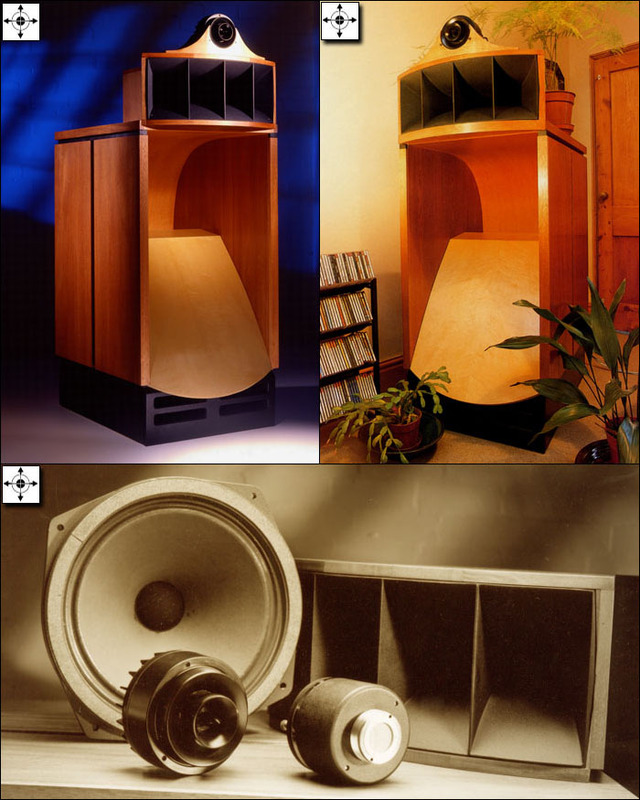 I am pleased to say that it raised a lot of music lovers' horizons and has inspired many speaker designers since. Just look at the number of horn designs around today. "The Air Partner bass driver was the Vitavox AK157. This uses a straight- sided un-doped paper diaphragm mounted in a massive cast basket attached to a huge magnet assembly. This was loaded to the bass horn via a phase correction plug to give an extra octave of performance above that which is normally expected from a unit this size. 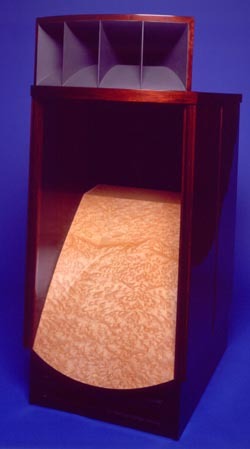 The bass horn was constructed entirely from high-density Birch Ply with premium crown veneers and solid wood lipping. "We used both the Vitavox S5 midrange driver but more often the Vitavox S2 AlNiCo variant. Both feature a chemically hardened 3-inch (75mm) diameter 50-micron thick aluminum dome driven by a 3-inch diameter coil operating in an intense magnetic field. The dome and coil former are a single piece, allowing the coil to be wound directly onto the dome with no intervening adhesive joint. "Smooth and extended high frequency output is aided by a complex arrangement of precision-machined tapering plugs forming three concentric air channels angled to converge at the heart of the unit. The driver then couples directly to a genuine multi-cellular high-frequency exponential horn formed as a single-piece aluminum casting. The extreme treble response of the Air Partner was handled by another smaller hornloaded pressure driver. In the initial design this was a Gauss bullet-loaded ring radiator. Later models employed the JBL2405H slot-dispersive unit. The Air Partner MKII horns were used at the launch party for Scottish folk rock band Runrig's tenth CD Mara in Edinburgh."